Former University of Tennessee star Rhyne Williams reached the semifinals at this year's U.S. Clay Court Championships. ATLANTA – Bob and Mike Bryan, the world’s top doubles team, will not compete in the BB&T Atlanta Open due to injury, Tournament Director Bob Bryant announced Saturday. Bob Bryan said a reoccurrence of an injury to his left shoulder will cause the duo to miss their first appearance at the tournament, played July 20-28. Atlanta is the first men’s tournament in the Emirates Airline US Open Series. "It is with great regret and disappointment that I announce that Bob and Mike Bryan won’t be competing in Atlanta," Bryant said. "Atlanta fans, especially those who regularly play and watch doubles, will undoubtedly miss seeing the greatest men’s doubles team of all-time. The Bryans are both dedicated professionals and I know this decision was not taken lightly. They have won more doubles matches than anyone this year and the grind may have caught up to them at an inappropriate time for us. We wish them well and look forward to cheering them on when they return to action." The Bryans said, "We regretfully have decided not to play in Atlanta next week. We feel badly as we have a lot of friends and fans in the Atlanta area and would have loved to have seen everyone. Bob Bryant and USTA Southern run a first-class event and we were excited to see the new site for the first time and participate in Monday's BroDown Showdown. "However, due to our successful spring and summer run, we have played more matches than we initially anticipated and this has caused a great deal of fatigue physically. We don't want these injuries and fatigue to hinder our chances to defend our US Open title next month. We need to take some time off to allow our bodies to recuperate. While we will not be in Atlanta this week we do hope to be back next year." The BroDown Showdown will continue Monday at 7 p.m. as planned with Ryan and Christian Harrison, James and Thomas Blake, and Jack and Eric Sock. Additionally, Georgia Tech "brothers" Juan Spir and Kevin King will fill in the fourth spot in the exhibition and have received a wild card into doubles. They have been roommates for three years and have the most doubles wins in the school’s history. King graduated with a degree in Mechanical Engineering and a 3.88 GPA. Spir, who has received a wild card into the qualifying draw here, is a three-time All-American, a one-time Academic All-American and has been ranked No. 1 by the Intercollegiate Tennis Association. Wimbledon finalists Ivan Dodig and Marcelo Melo will be the top-seeded doubles team and play the Harrisons in the first round. Second-seeded Santiago Gonzalez, of Mexico, and American Scott Lipsky will face off against Australians Lleyton Hewitt and Chris Guccione. The tournament is also announcing that the final singles wild card has been given to Rhyne Williams, of Knoxville, Tenn. 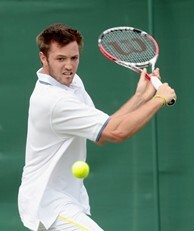 The former University of Tennessee star was the 2011 NCAA Division I singles finalist. His top result on the ATP World Tour is a semifinal appearance at this year’s Houston event. Connect with the BB&T Atlanta Open on social media by liking the BB&T Atlanta Open Facebook Page, and following on Twitter with the hashtag #BBTAtlantaOpen. For more information about the BB&T Atlanta Open, visit the tournament website.